Fall has officially arrived, but that does not mean your summer body has to go too! Don’t let your hard work at the gym go to waste. 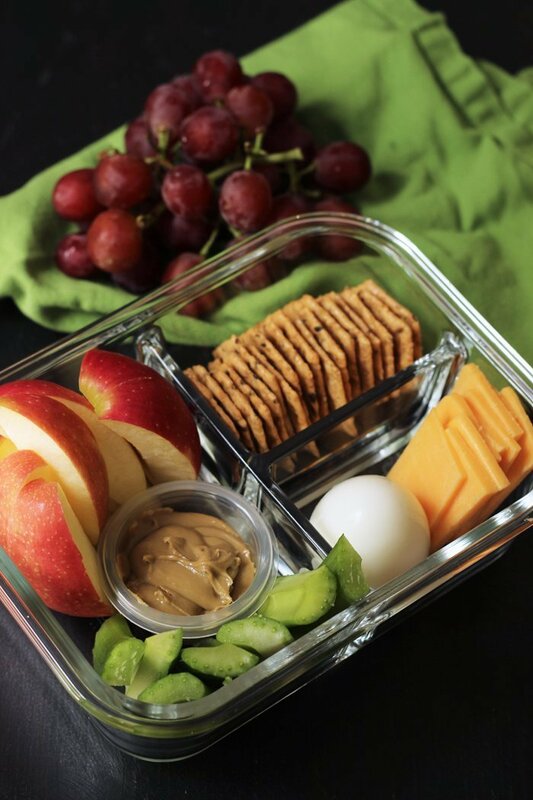 Take 5-10 minutes the night before work or school to prepare yourself a protein packed lunch. An on-the-go protein box is ideal for lunch or snacking throughout the day. These boxes can also be used as a late night snack if you are craving something small before heading to bed. Pick your favorite protein snacks and pack them up in a nicely arranged box. Boiled eggs: 1-3 eggs is the suggested amount that a person should have in one day. Correlate your box to ensure that you consume under 3 eggs throughout the whole day. Apples: Apples are rich in antioxidants and may keep you full for longer periods of time! Nuts: Nuts are packed with antioxidants and are a great source of fiber. On-the-go peanut butter packs: Use peanut butter or almond butter as a dip for your fruits such as celeries and carrots. Peanut butter is a great source of healthy fats and protein. Last but not least, add your choice of crackers! Just a handful of crackers for a source of carbs to satisfy your hunger and give you a boost of energy! These boxes are so small, they fit perfectly in your gym back for a convenient post-workout snack. Once you’re done with your on-the-go protein box, you’ll be satisfied and full while still maintaining a healthy diet! This entry was posted in Articles, Family Health, Health for Men, Health for Women, Health Tips, Protein intake and tagged easy recipes, Health for Men, Health Tips, healthy, high protein, Naturade, naturade protein powders, naturadelife, on the go protein box, Protein, protein boxes.